BATH – Maureen and Stephen A. Hassett’s Bath-based company can build just about anything, provided the product is made from composite materials. Custom Composite Technologies’ skill at manufacturing custom-made components, primarily for the marine industry, has earned it a niche in the composites market that has caught on across the nation and especially the midcoast region. Touting clients such as Hodgdon Yachts in East Boothbay and Lyman Morse Boatbuilders in Thomaston, the Hassett’s eight-year-old company is starting to garner broader recognition. The company was profiled in the fall issue of Professional Boatbuilder magazine. “It’s like being on the cover of Rolling Stone magazine. Professional Boatbuilder circulates worldwide,” said Maureen Hassett, the company’s vice president and Steve’s wife. The company moved from Lisbon Falls to Bath’s Wing Farm Parkway in 2003 because it needed space to expand. Stephen Hassett, who grew up in Yarmouth, trained in boat building in Eastport at the Boat School. He worked for a sloop builder in Rhode Island before joining Goetz Custom Boats in 1984, another Rhode Island company that specialized in composite boat building. Hassett went on from Goetz to work for several composite racing teams and boat builders. In 1999, Steve and Maureen returned to Maine, where they rented warehouse space in Lisbon Falls for their new business. But instead of building entire boats, they decided to build composite components for boats and other products. The couple, who now live in Brunswick, employ between six and eight employees, depending on the workload. Composites, commonly known as reinforced plastics, combine a strengthening fiber with a plastic polymer to create a strong, durable product. James Upham, Bath’s director of planning and development, said Custom Composite Technologies deserves the recognition it is getting. Custom Composite Technologies is also part of a growing trend, as the midcoast region attracts educational institutions and businesses interested in promoting the composites manufacturing industry. Southern Maine Community College in South Portland is expected to establish an advanced technology and composites training center at the former Brunswick Times Record office on Industry Road in Brunswick this year. 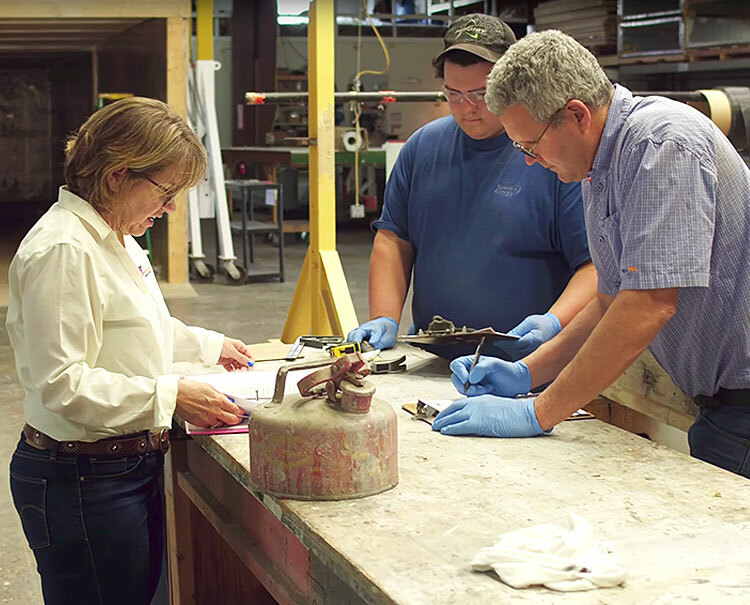 Students will be trained in the composites industry, creating a pool of much-needed skilled workers for companies like Custom Composites Technologies. In a related but separate business venture, Martin Grimnes, owner of Harbor Technologies in Brunswick, will partner with Topsham developer James Howard to establish a composites manufacturing and education center in Brunswick’s Industrial Park. Their venture, which is being called Allied Composites, combined with SMCC’s advanced technology center, could turn the Brunswick region into what officials are calling a composites cluster. The Hassetts are not joking when they say they will consider any and all order requests. Their production feats, which are specific to each client’s request, can range widely in size and type. Among the products the company has built are composite panels that reflect sunlight back into a Westbrook elementary school; fiberglass railing covers for a homeowner in West Bath; sailboats with carbon fiber and fiberglass hulls; boat decks; a composite mold for a ride at DisneyWorld; arms for a medieval-type catapult; a refrigerator box for shipping pharmaceuticals; and a 124-foot fiberglass mast. When they shipped the mast to Hall Spars of Bristol, R.I., in January, the Hassetts had to remove traffic signs and a mailbox to give the tractor-trailer bed enough room to maneuver through narrow city streets. Traffic on the Route 1 bridge in Wiscasset had to be stopped so the truck carrying a 20-foot wide pilot house built for Hodgdon Yachts could get across. The Hassetts say a waterfront location, such as the former Stinson Seafood cannery on Front Street, would be ideal because they could ship large products by barge. Hassett said composites are catching on with clients. “Composites have been around for years, but customers like it because it’s a durable product and it is lightweight. And it can give a company a lot of design flexibility,” he said.